Tina's Crop Shop: SIP Challenge #50 - Sketch! 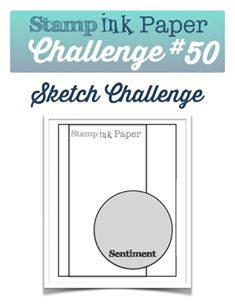 Hello and welcome to Stamp, Ink, Paper's Challenge #50! This week we have an awesome sketch challenge. I hope you'll head over and check out all of the design team's cards. I love how a sketch can take you in so many directions. Here is where the sketch took me this time.. I couldn't wait to use some of this new Playful Palette DSP that my sweet upline sent me. I have to tell you that once I saw it in person, I couldn't believe I hadn't added it to my own preorder! I just love the designs! So on this card I started out with an 11" x 4 1/4" piece of Peekaboo Peach cardstock scored at 5 1/2". I added a piece of Basic Black cardstock that was 3 1/4" x 5 1/2" to mat my Playful Palette DSP that was cut 3" x 5 1/2". On a scrap piece of Very Vanilla cardstock, I stamped my brush strokes from the Painter's Palette stamp set. I then stamped the sentiment over the brush strokes in Archival Black Ink. I added some black splatters with the Black archival ink as well. 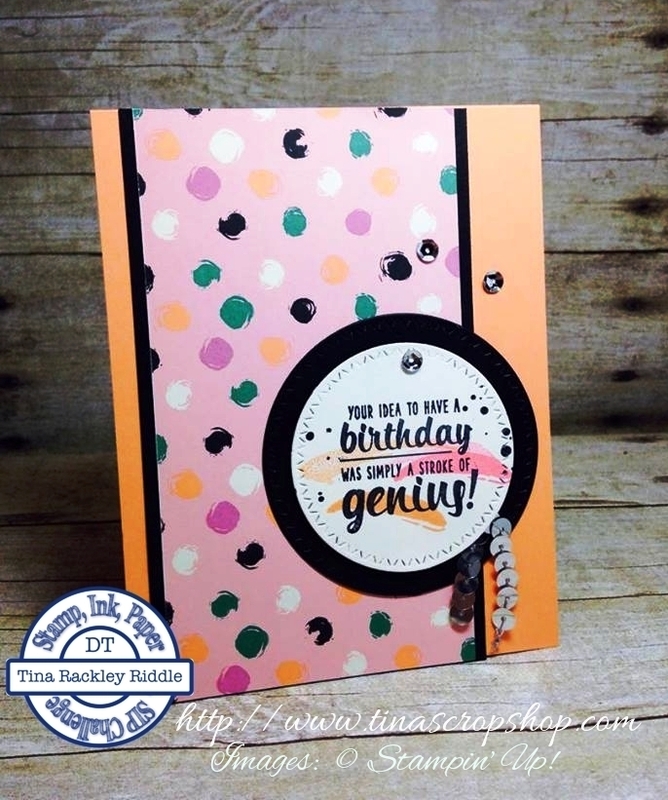 I used my MFT zig zag dies to cut sentiment circle and the black circle mat. Fast Fuse was used to adhere my black circle layer and I popped up the sentiment circle with Stampin' Dimensionals. I cut some Silver Sequin Trim and adhered just under the sentiment circle with a glue dot. I added three other silver sequins on my card to finish it off. I absolutely adore this sentiment and it makes the perfect birthday card for my sweet friend Suzi! I'm going to drop it by her house tomorrow! I just love how you used black to bring all those gorgeous colors out of the DSP. It reminds me of Goodie jellybeans. Yummy!